Demand Destruction is a term used to describe a series of economic actions that occur when oil prices become too high for the global economy to absorb them. In this environment, the economy goes into a recession and the price of oil correspondingly crashes. Oil's primary use is as a transportation fuel - 81% of the world's oil is refined into liquid transportation fuels (46% for gasoline, 9% for jet fuel and 26% for diesel and other liquid transportation fuels). The remaining 19% of the world's crude oil production goes into heating oil, electricity generation, plastics, synthetic rubber, asphalt and tar, wax, lubricants, adhesives, solvents, explosives, paints, sealants, corrosion inhibitors, cosmetics, fragrances, pharmaceuticals, fertilizer, pesticides, food flavorings, food additives and other industrial and commercial products. As oil prices increase, the input prices for the variety of goods listed above (including food) increases. These increased input prices, along with the increased transportation cost for these goods from higher fuel prices are normally passed on to the consumer. This increase in consumer goods prices is pure oil-price-induced inflation. While consumers must stomach these increased consumer goods prices, they must also pay more of their budget for gasoline. As the price of gasoline goes up, consumers will use less gasoline (which is what most economists are referring to when they talk about demand destruction in oil), but at the same time, the consumer will also be using more of their disposable income on gasoline, which leaves less money to spend on consumer goods (which are now more expensive due to oil-induced inflation). This creates a secondary (and more significant) oil demand destruction as the economy shrinks from lower consumer spending. One way to visualize demand destruction is to look at the average American consumer. The average American consumer lives on a tight budget. As the price of gasoline increases, the consumer begins to drive less. They will likely still drive to work every day (what we could consider their "base level" of oil demand), but they may cut back on their other driving - such as going out to eat during the week or driving to see family on the weekends. They might postpone that family vacation to Hawaii. All of these actions decrease their overall oil consumption. If the consumer is on a particularly tight budget, they may start carpooling or taking the bus to work - further reducing their oil demand. Meanwhile, the price of everything they purchase, from groceries to prescription drugs, has increased - cutting in to their discretionary consumer spending budget and further reducing their overall spending on non-essential travel and non-essential purchases. Because 75% of Americans live paycheck-to-paycheck (the vast majority of whom are also being squeezed by significant credit card debt) and 70% of the US economy is dependent on consumer spending, when you aggregate the drop in consumer demand from one person across all the consumers in an economy, the economy goes into a recession. Globally, we can aggregate the effect on consumer spending across the world economy. The UK, Germany and many other developed countries are very similar to the US in that their economies are extremely dependent on consumer spending. In China, consumer spending only accounts for 40% of the country's economy, but because it is a large exporter of consumer goods to developed economies, China's economy is extremely dependent on consumer spending in the developed world. Research has shown that the primary way in which oil price shocks affect the economy is through a reduction in consumer spending. At a certain price of oil, consumer spending falls off sharply; the world economies reach a "tipping point" and enter a recession. As the world economy grows, the short-run demand curve for oil shifts to the right. Normally the short-run oil supply curve would shift to the right as OPEC increases production and previously-uneconomical oil fields come back online in the rest of the world. But in a post-peak-oil world, OPEC's ability to increase production is limited and this short-run demand curve cannot move any further to the right. 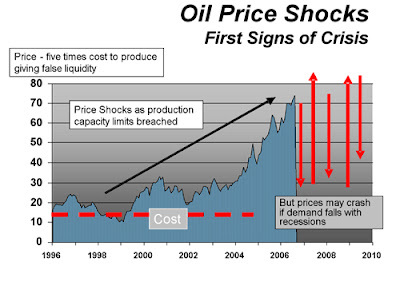 As you can see, in a peak-oil world, short-run quantity supplied hits a wall and the price of oil keeps increasing. 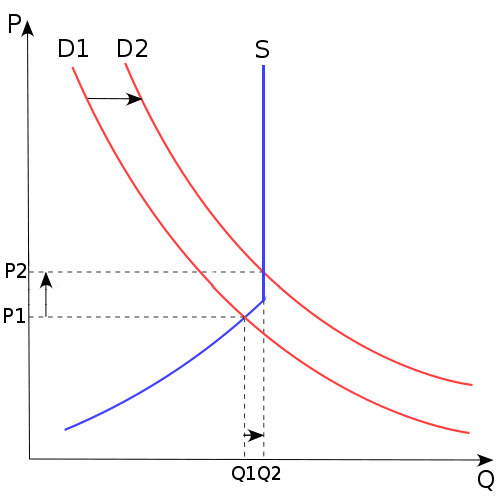 This is the economic mechanism that causes a "price spike". When the price of oil become too high, the economies of the world can't afford the additional oil cost; the world economy goes into a recession and the short-run demand curve for oil shifts back to the left. Since oil production is inelastic in the short-run, the price of oil plummets. This is the core of "demand destruction". As the oil price drops due to lower oil demand, the low oil price helps the economy slowly recover. This economic recovery brings more demand for oil and the cycle continues. This cycle of oil price spikes, recession and oil demand destruction is referred to as the "bumpy plateau". This mechanism may hide the true peak of world oil production for a number of years as oil price spikes and recessions cause the daily world oil production rate to vary significantly as we get close to and pass the point of world peak oil. 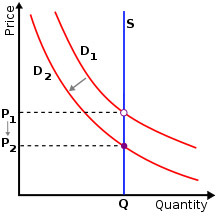 In the long run, as the worldwide oil production rate moves down the far side of Hubbert's Peak, the supply curve will shift to the left at the global aggregate depletion rate, further increasing prices. In the long-run, high oil prices should help encourage increased investment in additional oil drilling as well as increased investment in oil alternatives such as shale oil and tar sands projects. However, due to the rapid nature of price movements and demand destruction, the market sends mixed price signals, hindering the investments needed to shift the long-run demand curve to the right. In the long run, people will trade their SUVs for hybrids or move closer to work and companies will increase the fuel efficiency of their operations, and purchase more fuel efficient trucks and airplanes, etc. All of these efficiency improvements that would shift the long-run demand curve to the left, however, take a long time to implement and are particularly difficult to justify when the price of oil plummets along with the economy due to demand destruction. The average consumer will be feeling financial pain during the recessions and when they see that the price of oil has plummeted (due to demand destruction) they may not see the need (or be able to) trade in their vehicle for a more fuel efficient model. The average consumer "trade cycle" for cars is 52 months, far longer than the duration of a typical price spike and demand destruction cycle, meaning our society will be slow to increase vehicle fuel efficiency. Indeed, even now with oil prices rising nearly 15% over the last 6 months, sales of SUVs and pickup trucks are outpacing sales of cars in America by the widest margin in 5 years. Consumers simply don't understand the price signals. These mixed price signals and economic volatility also make financial modeling difficult for firms. This, combined with the difficulty in justifying capital expenditures during a recession, means the implementation of efficiency projects in firms (which would help them become more resilient to future price spikes) may be slow. This will further reduce the ability of our society to shift the long-run demand curve to the left. For oil companies, these periods of low oil prices due to demand destruction also make it difficult to finance new oil projects which would help offset the global depletion rate. 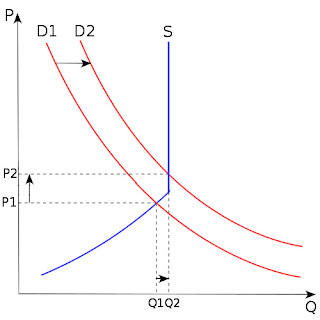 This prevents the long-run supply curve from shifting to the right against the leftward shift caused by the global aggregate oil depletion rate, the net result of which is increasing oil prices. Large-scale shifts in transportation infrastructure (high-speed rail, electric cars, renewable electricity generation, etc.) will likely only be possible with extreme government involvement. Given the history of partisan government gridlock during recessions (as we are seeing now), these fundamental infrastructure changes may take a significantly long time to implement, thereby prolonging the bumpy plateau. The last oil price spike we had was in 2008, when crude oil reached an all-time high of $147 per barrel. It would appear then, that $150/bbl is the upper limit in price of what economies can afford without tipping into a recession. This price, however, is based 2008 dollars and because the US government has injected trillions of dollars into the economy through bailouts and quantitative easing since then, it isn't known what the trigger will be in dollar terms the next time around. A better way to find the demand-destruction-inducing price of oil is to look at oil prices as a ratio to other commodities or indices. After running the data through a statistical trading model, I found the optimal trading triggers, based on these ratios. If the S&P/Oil ratio goes below 12, oil is about to become so expensive that it will "break the system", in this case, Sell Oil, Short the S&P 500. When the economy crashes, if the Gold/Oil ratio goes above 20, oil is too cheap compared to gold, in that case, Buy Oil. We're currently seeing an upward swing in commodities prices. You should be holding oil and other commodities at this point. The best trigger to keep an eye on for the next few months is the S&P/Oil ratio - if oil prices begin to spike and this ratio drops below 12, Sell Oil, Short the S&P 500.